This male fox rests on a rock and keeps a wary lookout while his three offspring play nearby. The white tip of the tail is characteristic of red foxes. The female is either resting in the underground den or off hunting. A red fox crosses the road ahead as your car rounds a bend in the early morning, or appears briefly at an old stonewall before vanishing into the nearby woods. In this way, Westborough residents get occasional glimpses of one of the larger wild animals that shares our region and sometimes lives closer to us than we realize. In spite of changes in Westborough’s natural environment as the town has developed over the past several decades, red foxes (Vulpes vulpes) remain with us. Local farms have given way to clusters of houses with lawns, but the landscape is still a mix of open areas and woods that provides a favorable living area for them. It doesn’t hurt that red foxes are smart and adaptable, as their starring role in many folktales and old stories would suggest. They’ve been here for a long time. Red foxes are native to North America, as well as Europe and Asia. European settlers also brought them here for fox hunting, particularly in the southeastern U.S. So was that dog-like form you saw moving in the gray light of dawn or the fading twilight – when color is hard to see – a red fox or a coyote? That’s a good question, since we have both in town. Coyotes (Canis latrans) are relative newcomers, but most of us haven’t seen enough of either one to be good at telling the difference at a glance. Red foxes are smaller than most of us think. Adults weigh only 8-15 pounds and stand 14-16 inches high at the shoulder, compared with 20-40 pounds and 15-20 inches for coyotes. Red foxes look larger to us than they are, thanks to their thick fur and full tail or “brush”. Coyotes are one of the few predators of adult red foxes in Massachusetts. Others are humans and bobcats (which have been seen in towns north of us). As coyotes become more common in our area, red foxes may move closer to humans, where coyotes are less inclined to venture or set up territories. The growing young foxes stalk each other and tussle while the father of the family, weary from a night of hunting, rests nearby. Large ears provide keen hearing that alerts him to possible danger and to the location of typical small prey, such as chipmunks and mice. When are you most likely to see a fox? Look for them year-round, including winter, especially around dawn and dusk. Unfortunately for most would-be fox-watchers, they’re usually active at night. Like cats, red foxes see well in the dark, aided by a special membrane at the back of their eyes that reflects light. This arrangement allows their eyes to use the light on its way in and also on its way out. In broad daylight, their pupils narrow to vertical slits, also like cats’ eyes, so they can adjust quickly to brightness. 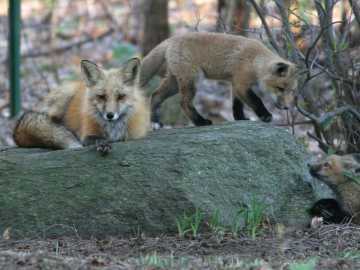 Red foxes hunt small animals, especially rodents, such as mice, chipmunks, voles, shrews, and squirrels. 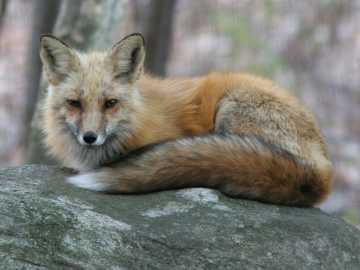 Like red-tailed hawks (and cats), foxes help to keep rodent populations down. Watch for them where their prey lives – in fields, along stonewalls and at forest edges. Many of us have seen a fox pouncing, not in real life but on TV nature shows. The fox stands still in a field of grass or snow, listening, and finally leaps in a beautiful, high arc to land on or near its hidden prey. If the leap was a near miss, another one may follow. During most of the year, you’re most likely to see a lone fox. Red foxes hunt alone, more like cats than many other members of the dog family (Canidae), which often hunt in groups that chase and tire out larger prey. Not only does a red foxes pounce, but it also crouches and stalks small prey until it’s close, as a cat does. Then the fox puts on a short burst of speed for the kill. Red foxes also eat rabbits, frogs, earthworms, large insects such as grasshoppers, eggs, occasional birds and carrion. If a fox catches more food than it can eat, it hides or buries its kill for later. What about the tale of the fox and the grapes? Foxes do indeed eat fruit, especially grapes and berries. As fruit ripens in mid- to late summer, you might spot a fox visiting an orchard, grapevine and old fruit tree in the woods. Male and female red foxes pair up in December-January. They often have several underground burrows at various locations in their territory for hiding or resting, but they use a larger main burrow for raising their young. They sometimes enlarge an old skunk burrow or woodchuck hole, which might be near human dwellings or under an outbuilding. Lying among pine needles, this youngster, probably between one and two months old, has the typical black stockings of a red fox. 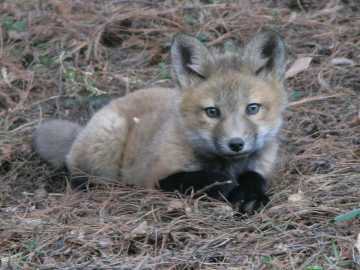 Young foxes are born gray, but like this one, begin to get a reddish color after several weeks. Their blue eyes eventually turn brown. Young are typically born between mid-February and mid-March. The male fox hunts and brings back food for the female and the young but stays out of the main den. If the den area is disturbed, the adults may move their young to a different den. Once the little ones are old enough, the female also starts making hunting trips. The male and female lick and groom each other and their young, strengthening family bonds. The little foxes play, but they also fight for dominance. It’s serious business. If the parents can’t bring enough food, the dominant youngsters are more likely to eat and to survive. By summer the family group leaves the main den but stays together until fall. The young foxes become fully independent around 10 months of age. At that point they usually leave in search of their own territories and mates. Many thanks to our Westborough friend and fan of nature who shared a backyard view of a fox family so we could bring fox photos to readers of Nature Notes.